If there is one thing I need to have in my kitchen cupboard, it’s garlic. Take the onion, tomatoes and whatnot, but please, leave the garlic! It’s the smell of home, redolent of hearty dinners and simple suppers, of good times cooking and eating. I even love it when I catch the faint scent of garlic wafting from my hands after cooking. 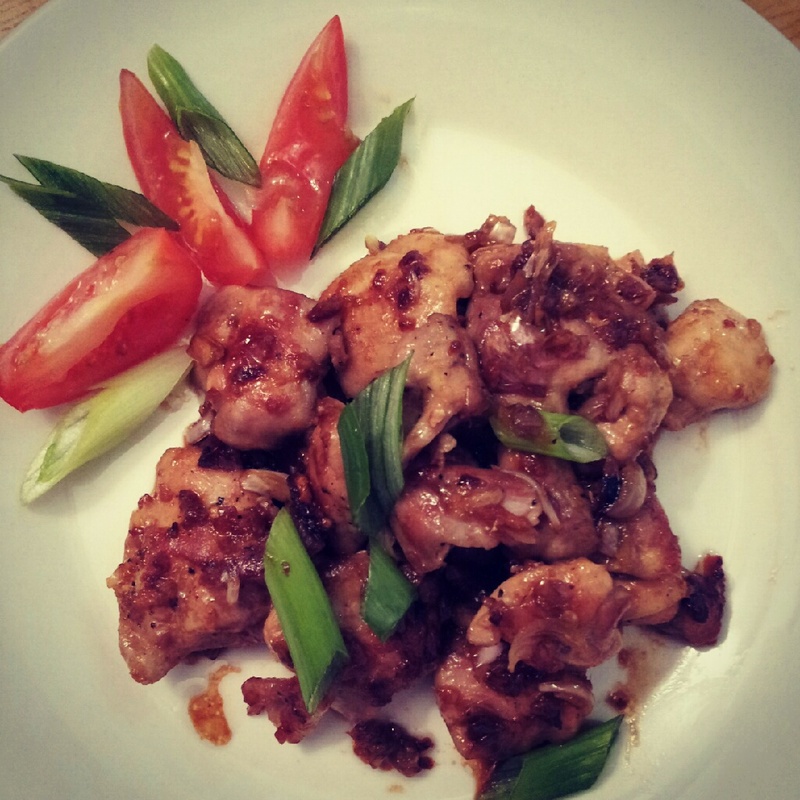 My love of garlic led me to Kanzensakura’s post on ‘Chicken with Garlic Sauce’. I stumbled on the post two weeks ago and since then, wasn’t able to get it out of mind. The dish sounded easy, incredibly tasty, and also different: I’m used to stir-frying but this one called for browned, pan fried chicken. Yum. I could taste the caramelised garlic already. Click here for the recipe! NB I didn’t stick to the measurements very closely (not having a tablespoon or teaspoon…), nor did I add sake because I don’t have any, but dinner still turned out amazing :D. It’s really important to let the chicken brown on each side before turning it, and also, to half cover the pan so that the chicken doesn’t dry out. Don’t worry about adding the sauce mixture much later too; it’s supposed to be more of a glaze, rather than a sauce. Sigh, this definitely can be filed under my list of comfort food recipes… and it’s given me ideas on how I could do this with many other sauces… ginger, miso, black bean! Pan fried beef with black pepper, anyone?